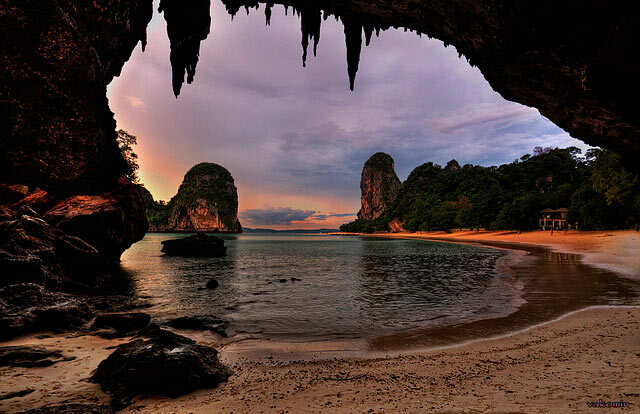 This piece of heaven on earth is on the peninsula of Railay. He captivates with its beauty and is certainly worthy takes his place in the list of the most beautiful beaches of Thailand! You can get here only by sea boat, which carries passengers several times a day. Particularly fond of the beautiful beach climbers, because they from the top of the limestone mountains can see all the beauty of Phra Nang. From the height opened magnificent views of the white sand and turquoise water, surrounded by limestone cliffs and caves. The highlight of the peninsula is considered to be a cave drowned princess, in her honor and was named the beach. Where you can hide from the sun in the shade of the trees, the rocks surround. There is also a coral reef — a great place for snorkeling. Another feature are the boats that swim up to the beach with a view to feed the tourists. Traders directly from their boats selling all sorts of goodies for travelers.